Some plants I see and fall in love with instantly and want to get one…when reality sets I know this is impossible as I have no spot to put it. I will forget about the plant and later stumble on it in other places and remember all over again how beautiful it is. 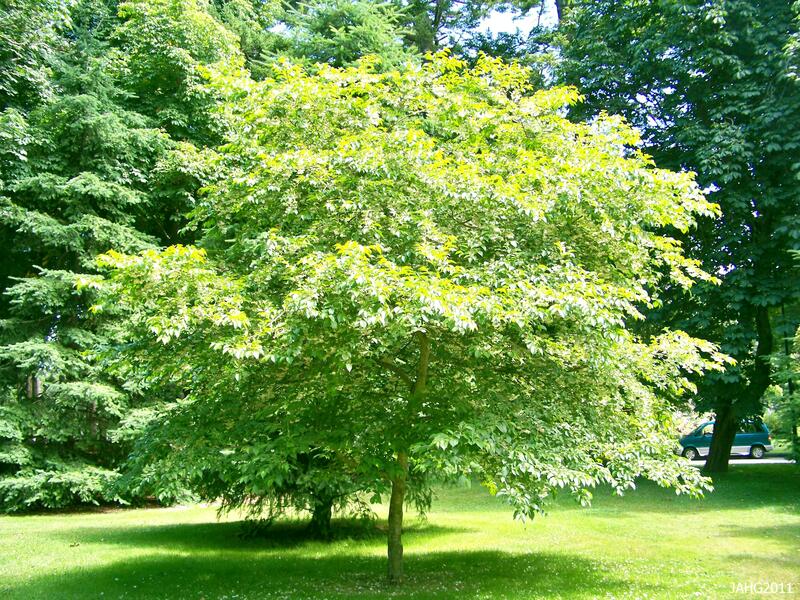 Such is the case with Styrax japonius(a) (Japanese Snowbell tree), its a tree which I keep stumbling on and see how wonderful it is. The dainty scented white bells of Styrax japonicus coat the undersides of this small tree. Styrax is a genus of 130 species of which only a few come areas other than the tropics and several are used in garden. 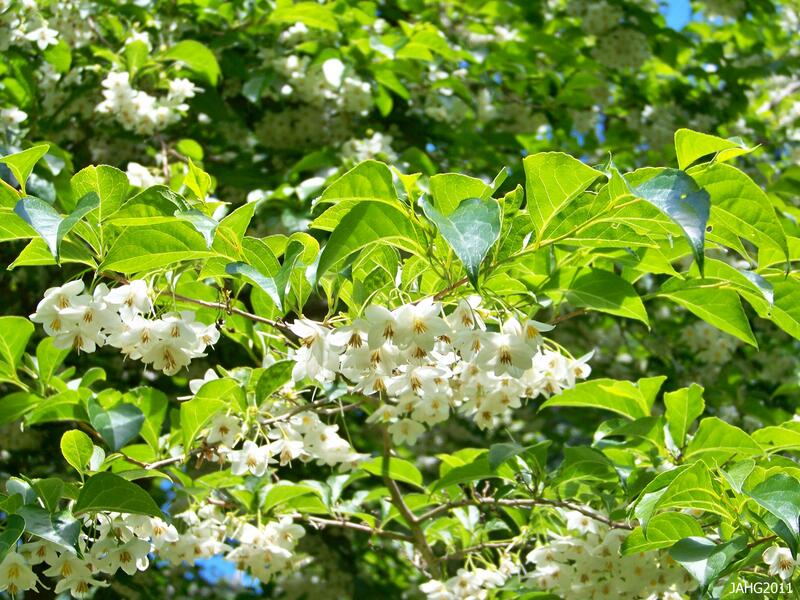 Styrax japonicus is the most well-known of the ornamental plants. Some tropical Styrax species are also known for giving us benzoin resin which is exuded from piercing the bark and collecting the dried substance. The resin has been used since antiquity in perfumes, incense and medicines(tincture of Benzoin). 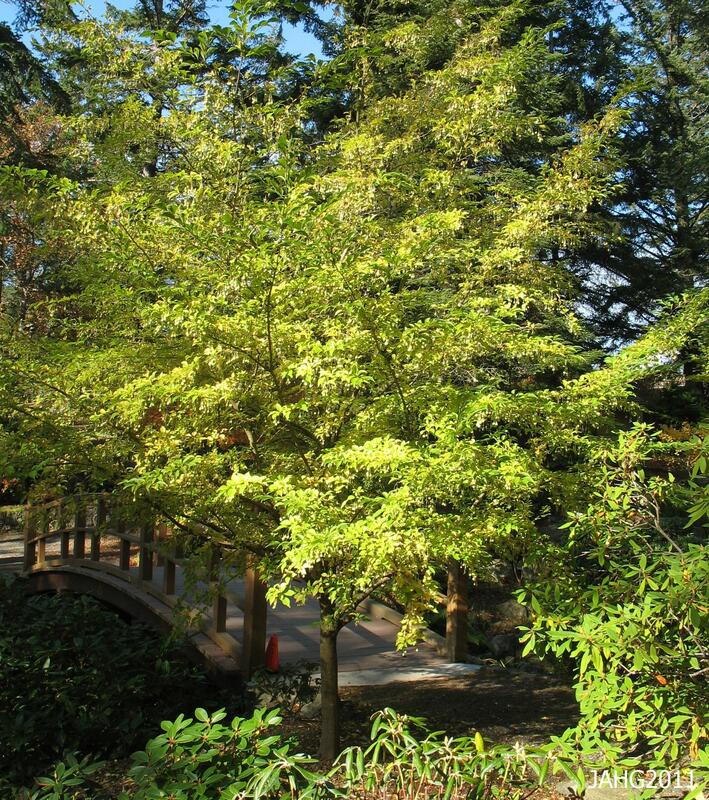 The Japanese Snowbell is a small layered tree with elegant leaves and flowers. Styrax japonicus come from a fairly wide area of Asia from Korea into China and Japan. Japanese Snowbell was first described by Seibold and then re-introduced by Richard Oldham(1834-1862) in 1862 from Japan. He was employed by the Royal Botanical Gardens(Kew) and was sent to collect plants in Asia in 1861. He first collected around Nagasaki and Yokohama (1862-3) and later in China where he died at the age of 27. He introduced no new species but his extensive herbarium collections were studied at Kew and in Leiden Germany. Styrax japonicus 'Rosea' has the lightest pink tinge at the base of the flowers. 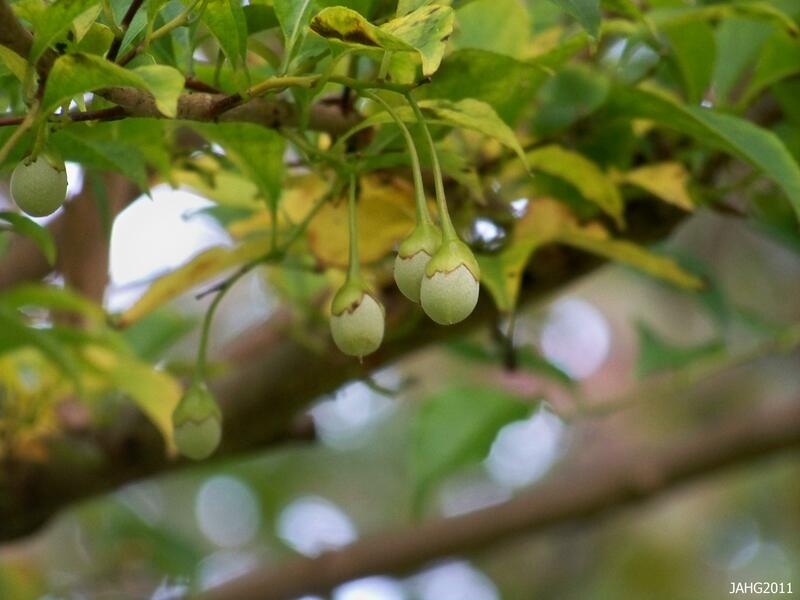 When Japanese Snowbell was introduced the public in the 1860s it must have made an impact on gardeners and other esteemed people as it was quickly awarded a First Class Certificate (FCC) in 1885 by The Royal Horticultural Society. In 1984 it was given another award by the same group an AGM (Award of Merit). These awards are made from recommendation by a committee to the RHS council and are similar to judgements made at exhibits (based on samples, branches or plants which are viewed on one day). Styrax japonicus are very late to color up in autumn and when they do we are rewarded with buttery yellows which fade to light reds. Japanese Snowbell are small trees which have layered branch structures. They are often nearly as wide as they are tall. When they are in bloom the flowers coat the undersides of the tree with small drooping white bells which have a pleasing light perfume. It is best to locate these trees where they are on a slight incline so it is easy to view the flowers in bloom. The fruit produces are small drupes which look like tiny nuts and are dainty. Tiny egg-shaped drupes are the fruit produced by Styrax japonicus. Japanese Snowbell trees grow 6-9 m 20-30 ft.) tall and nearly as wide. They grow in full sun to dappled locations and even fairly dark areas. Like many small trees in its native habitat it is often found as an understory plant growing amoungst larger trees. It likes well-drained rich soil which is slightly acidic.These trees are surprisingly hardy and are rated as zone 5 -29 c. (-20 f.). Styrax japonicus (Japanese Snowbell) are perfect small specimen trees for urban gardens. 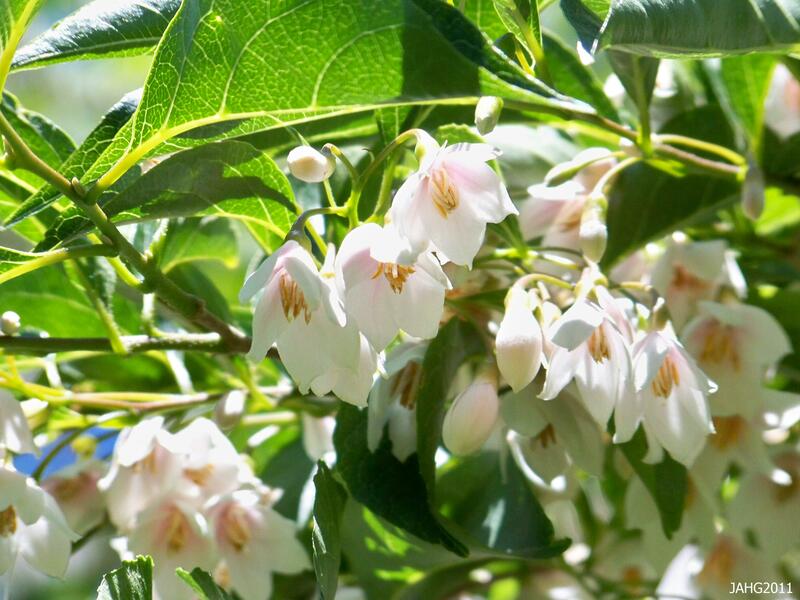 Styrax japonicus can be used in a variety of ways, they are ideal for as small specimen trees, for small urban lots, patio plantings and in small groups. They are also well-known as bonsai subjects. There are several named forms worth looking into. ‘Emerald Pagoda is a selection which is more robust with bigger flowers and leaves. ‘Pink Chimes’ has better, more pronounced color which does not fade out in heat. ‘Carillon’ is a weeping form which is said to be the same as ‘Pendula’. ‘Angryo Dwarf’ is as the name say an even shorter form. It is up to you what one you feel is the best for your situation…I have always been a sucker for pure white flowers! Seducing You With Scent on Grey Days. 2 days of bright sun light and everyone is out mowing their lawns, the garden centers a full of shoppers buying plants, then back into the grey. It has been grey and dreary almost everyday this year! It is not surprising at all that we rush out into the rare spots of sun and then slump around the rest of the time in a mental fog. Is it no wonder that brightly colored flowers appeal to us so much, at this point any garish and screaming color at all is welcome. One of the brightest groups of plants that bloom at this time are the deciduous Azaleas which come in the purest oranges,tangerines, golds and yellows. Rhododendron luteum (Pontic Azalea) says it all in its name – I have brilliant yellow flowers and I am here to seduce you out of your fog with my fragrance. Here most people associate Rhododendrons with the evergreen types and do not realize that the Azaleas are actually Rhododendrons as well. The ‘so-called’ Azaleas often are seen to be a poor plants you see in mass plantings used to landscape large shopping centers, townhouse complexes and other institutions and are often poorly maintained. Rhododendron luteum represents the deciduous Azaleas most often found in parks and often have the reputation of ‘smelling skunky’. Pontic Azalea does not have the ‘skunkiness’, people often wonder were the wonderful scent is coming from and find out it’s from that yellow Azalea! The elusive fragrance of the Rhododendron lutuem flowers entrance the bees and our noses, but be wary as the pollen and honey is poisonous. Pontic Azalea is a fairly wide-spread plant and is found in Poland, Austria through the Balkans, Southern Russia running into the Caucasus into the southern tip of the Black Sea, an area once called Pontus. 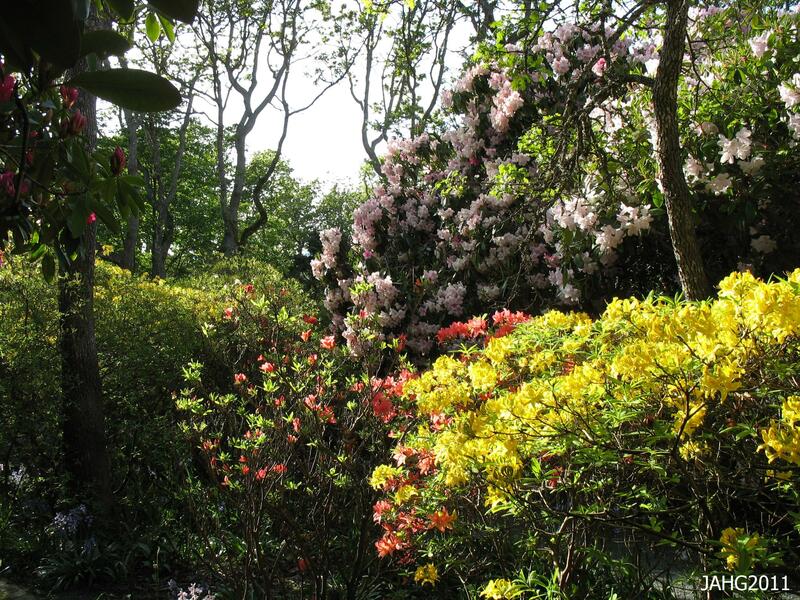 The first reference to Rhododendron luteum comes from Pliny and Doiscorides ( circa 40-90 AD) who refered to the works of Xenophon(430-354 BC). Xenophon participated and chronicled the conflict between Cyrus the younger(and gardener) and his older brother who would become Artaxerxes II. They went to war and Cyrus died and his army retreated to the Pontus Hills near the Black Sea. The plan was to collect supplies there and escape by sea back to Greece. While the troops where there the ate the locally collected honey which came from the Azaleas which grew there. The army became ill and seemed drugged. This mystery of what happened was blamed by Dioscorides on the Pontic Azlaeas and the honey which was consumed there. 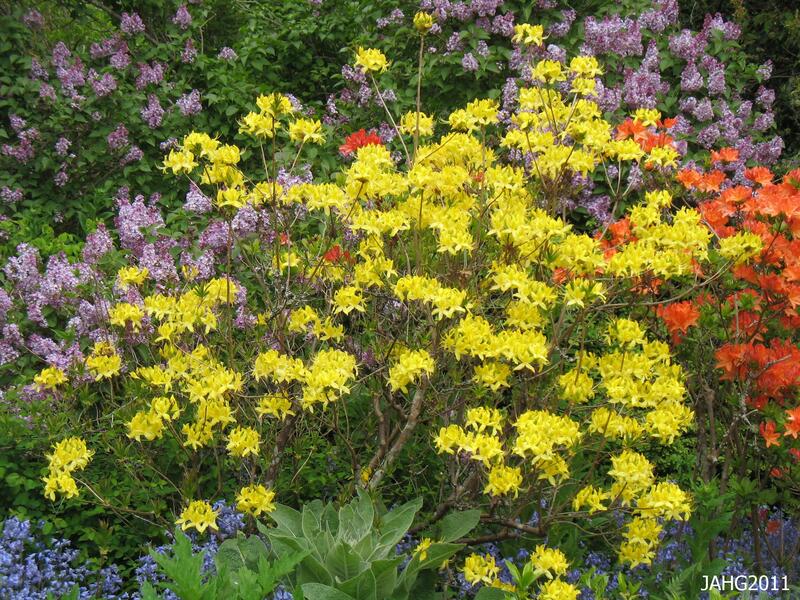 As Rhododendron luteum is often grown from seed there is some variation in the flowers such as the vibrancy of coloring and width of the petals. Many centuries later French botanist Joseph Pitton de Tournefort(1656-1708) travelled to examine the geography of the area as he was studying Dioscorides. There he wrote a description of and did a drawing the Pontic Azalea which he named Chamaebodobendron Pontica Maxima flore lutea, this was just the first of the names this plant has been given. 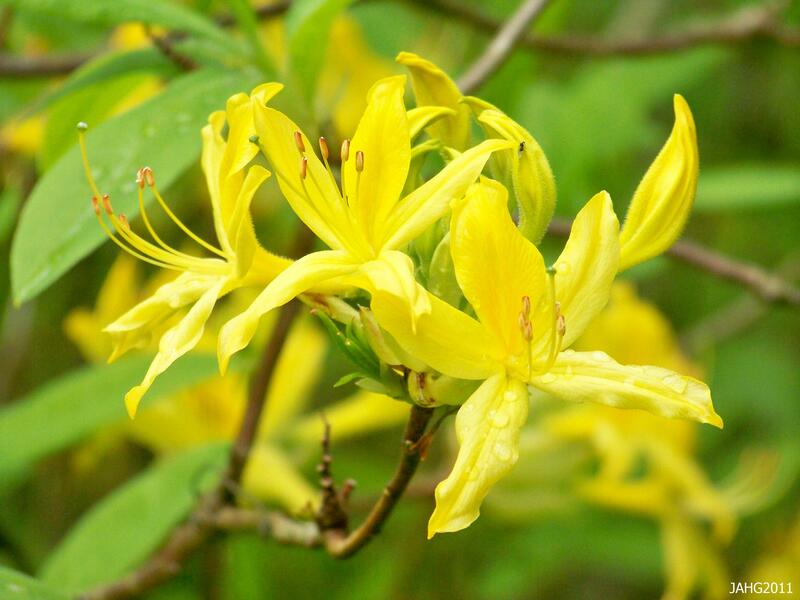 The bright yellow color of the Pontic Azalea is pleasing and blends well in many plant combinations. Rhododendron luteum went through several name changes until in the 1830s it was decided to give it the name it is known by now. Most recently the claim to fame by the Pontic Azalea is that it is an important contributor to hybridization of Azaleas in creating a wide range of pleasing colors for the softest pastels into most vibrant colors. Pontic Azaleas are particularly associated with the Ghent group of hybrids which were developed in Belgium over 150 years ago. More than 100 were named and at least 25 are still available to buy now. The other use for Pontic Azaleas is for a understock to graft weaker growing forms onto. 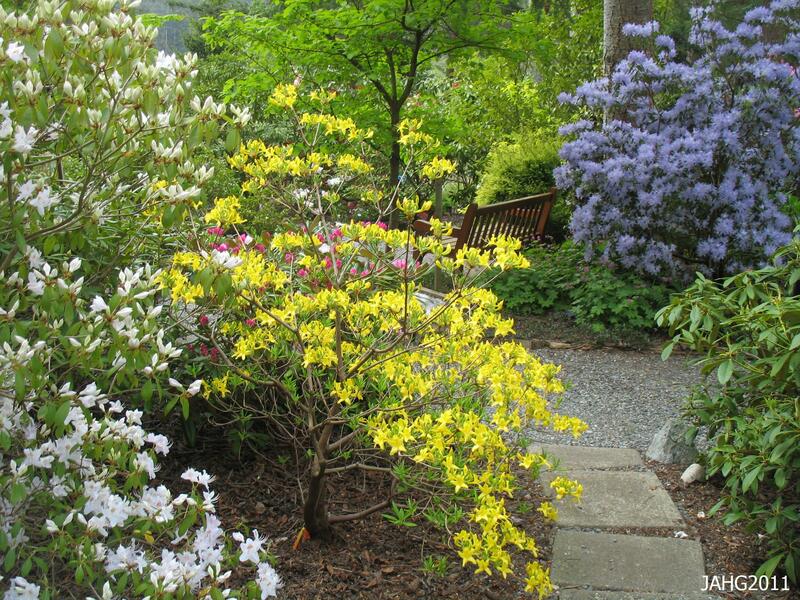 This small Pontic Azalea is part of the extensive Rhododendron collection at Glendale Gardens. 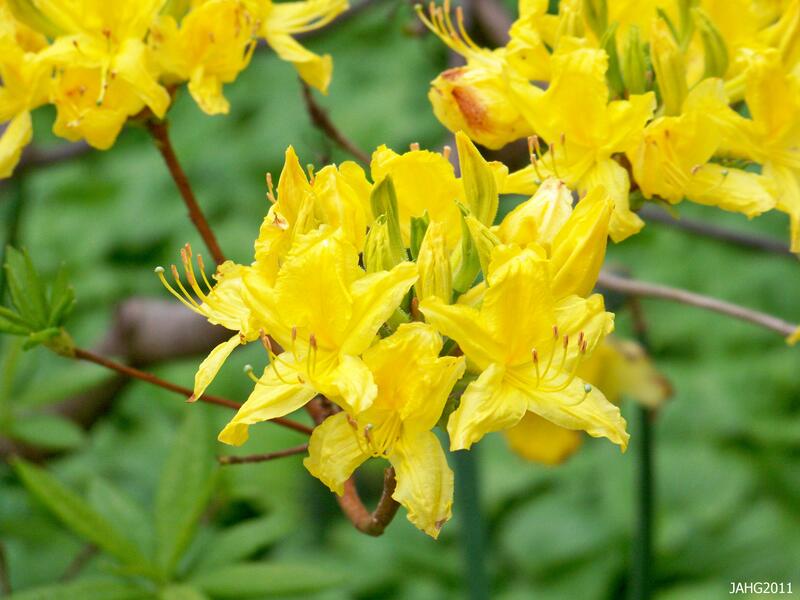 Rhododendron luteum is an easy and adaptable plant to grow. It likes dappled light and rich, slightly acidic moisture retentive soil which does not dry out completely in droughts. This helps promote a larger number of blooms the following year. Good air circulation is important to help ward off any chance of mildews or fungus which can develop later in the season. Established plants do not need fertilizer but appreciate a light mulch of pine needles or other acidic material applied every year. Do major pruning as soon as the plant has finished blooming to avoid cutting of next years blossoms. Playfair Park has several areas with Pontic Azaleas included in the gardens. 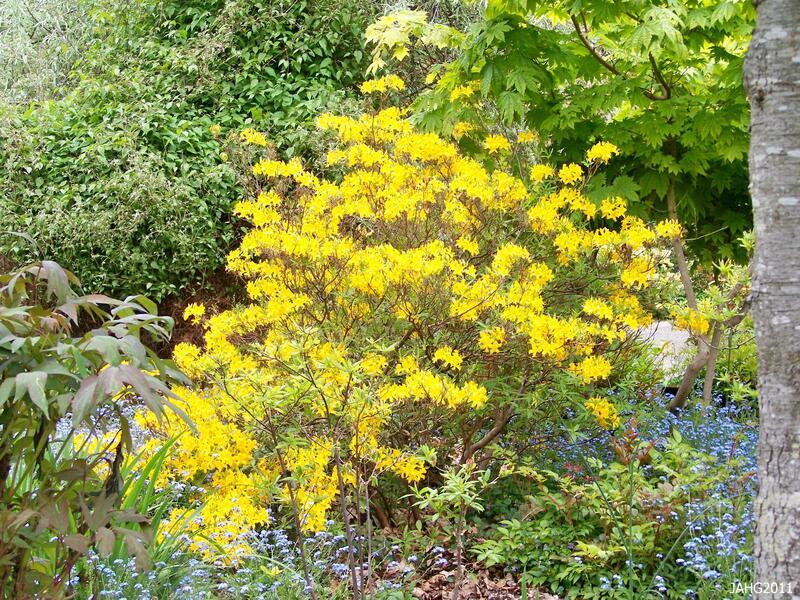 Rhododendron luteum grows 3-4 m(9-12 ft.) tall and is narrower in width. 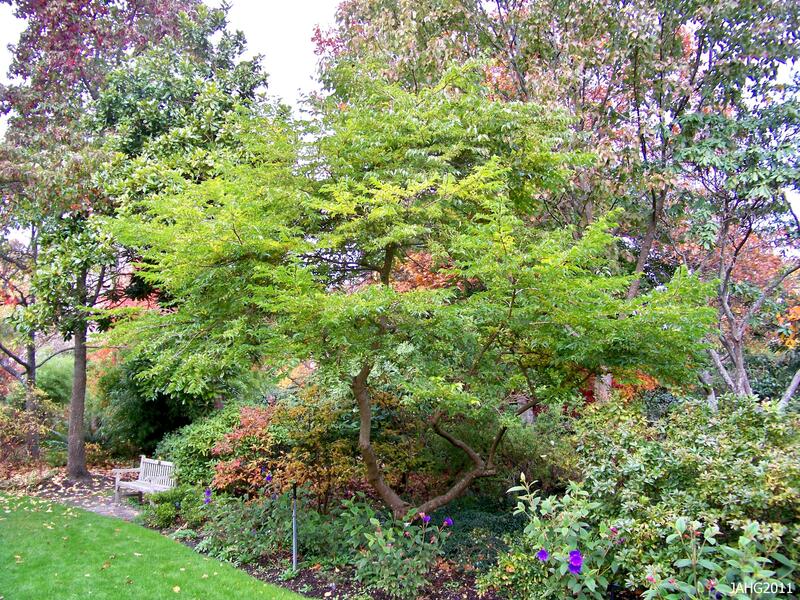 It is not densely branches and is light and airy in the garden. In autumn it give another show of red and yellow foliage colors. It can be used as a specimen or accent and as a mass planting. 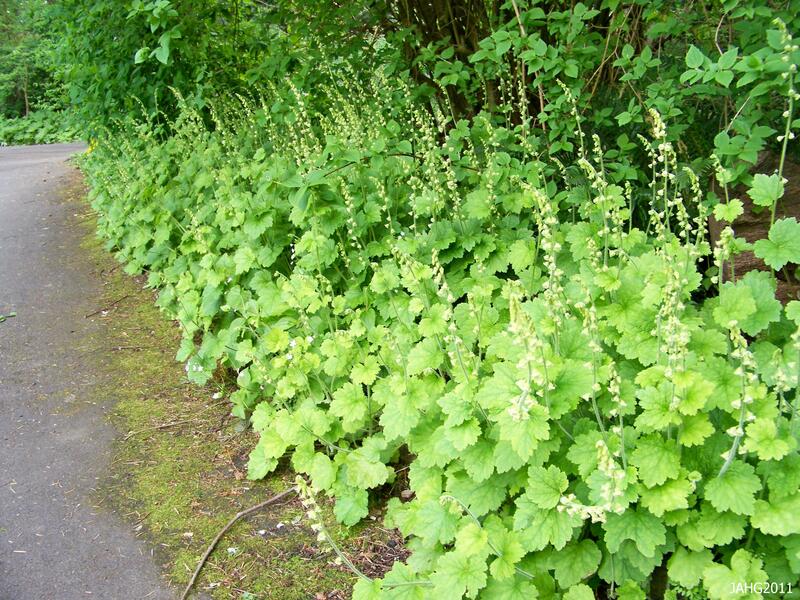 It is a good plant for a woodland or wilder setting or can be used in more formal locations. It is said to take -15 c. (5 f.) which makes it one of the more hardy deciduous Azaleas available. When I was going to for Horticultural training the thing I missed the most was walking in the woods like I could do at Home. I had come from a rural area to a verge large city to go to school and going for a walk was a way to relieve tension from my studies. There was a small park at the end of my street which was undeveloped and I would visit there and find new(to me) plants which where native to the area. 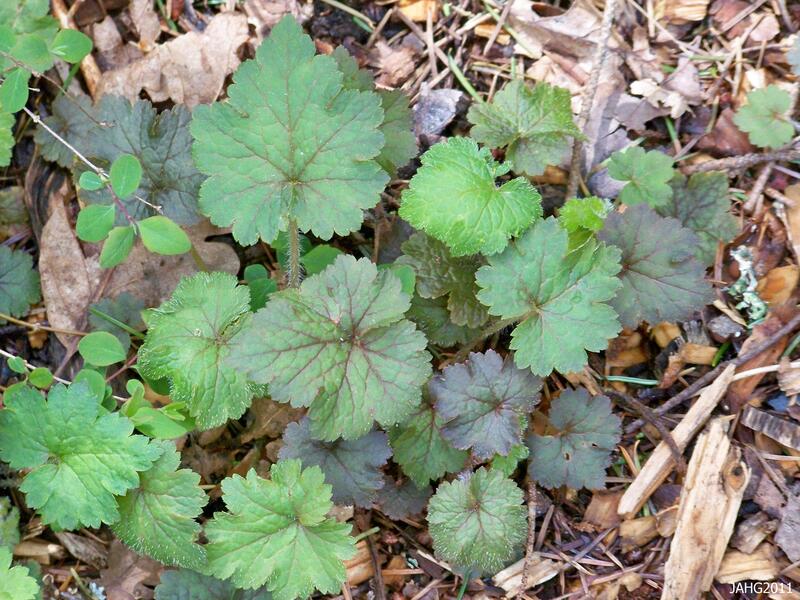 One plant I came across looked kind of familiar, like a Heuchera but different, as it turns out it was a close relative. Tellima grandiflora (Fringe Cups) is related to several well-known garden plants and should be seen more in gardens. 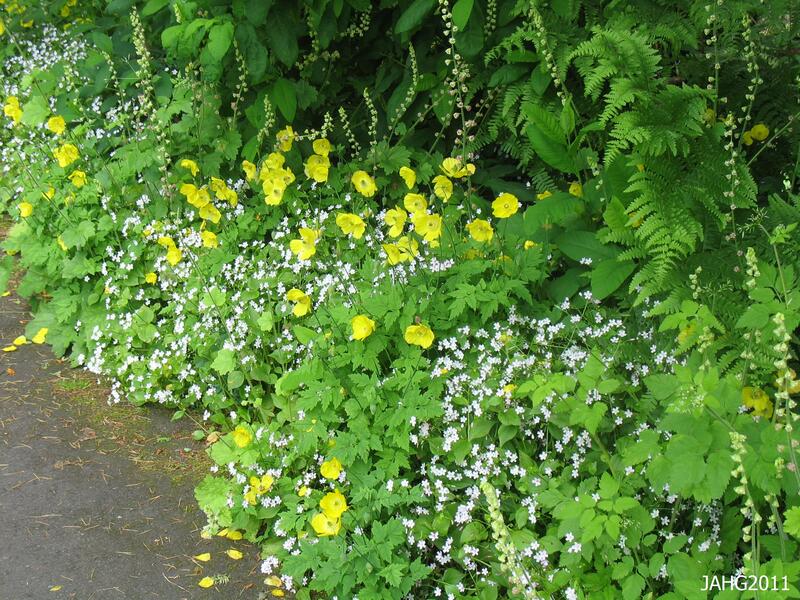 Tellima grandiflora (Fringe Cups) are found edging a shade path in Beacon Hill Park. I always am interested in what the botanical latin name of a plant means and how it might relate to it. In the case of Tellima it turns out to be an anagram of another plant which is closely related to it: Mitella. I have found no information on why an anagram was chosen for its name. Another case I know of is for a species of cactus Lobivia which is an anagram of the country which it is found in Bolivia. Grandiflora is not at all unusual and refers to the large flowers. The common name 'Fringe Cups' refers to the lacy petals of Tellima grandiflora flowers. Tellima grandiflora is a plant which grows in the woodlands and dappled light of the Pacific North-west from Alaska through British Columbia, Washington, Oregon into Northern California. This is generally a plant of coastal areas and along the mountains that run just inland. They are also found in the inland wet stripe running through eastern B.C., Washington, north Idaho and Montana. 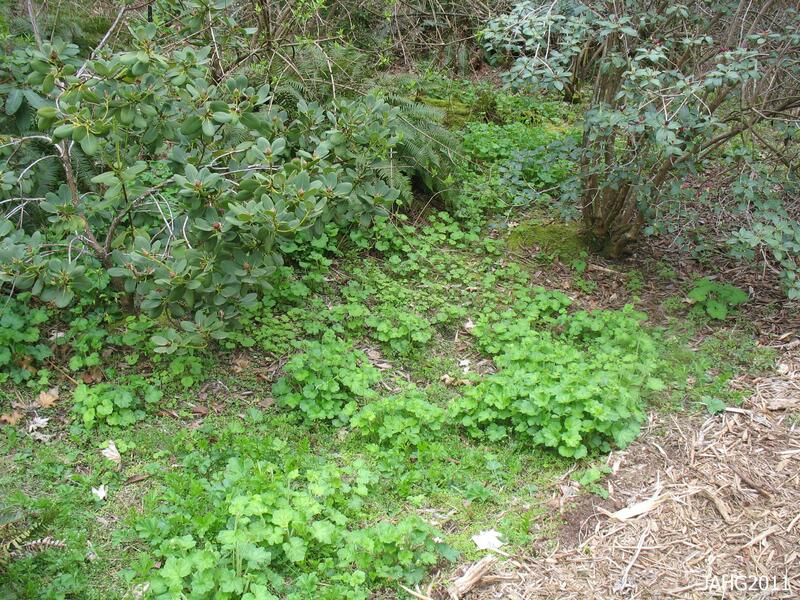 Here on Vancouver Island it is a common site along roadsides and is often mixed with other plants such as Tiarellas, Sedges and Ferns. Here at U.B.C. Botanical Gardens the Tellima grandiflora grow wild as a natural groundcover in the Asian Garden. 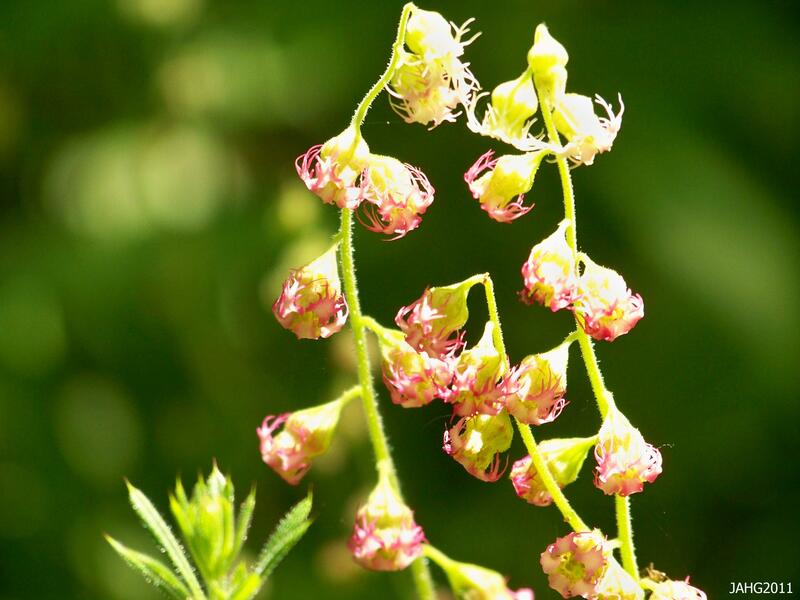 Tellima grandiflora comes from the Saxifragaeae which has given us many familiar garden plants such as Saxifraga, Heucheras, Tiarella and Fragaria (Strawberry). All of these species have been hybridized and are well used in the garden. Tellima grandiflora may have been hampered in its acceptance because it is a is the only species of the genus and is not represented in any other form in the world. There are records of crosses between Tiarella and Tellima being found as well as that of Tolmeia menziesii crosses but none of these have been seen as worth being developed as they have much smaller flowers than Fringe Cups and the foliage is not unique enough. Only recently has been offered a named Tellima grandiflora ‘Forest Frost’ which to me looks like it probably is mis-named and is fact a cross with a Heuchera. It will be interesting to see what comes of this new plant. Winter coloring of Tellima grandiflora often brings out burgundy tones which fade with new growth. Tellima grandiflora for the most part is a well-behaved garden plant. It self-sows in place that it is happy, if this is not wanted all that is needed is to remove the spent flower wands soon after they finnish blooming. It can be somewhat short-lived like many members of the Saxifragaeae family are, therefore i usually keep a few seedlings about to replenish older plants and I like how they will pop up in my pots of Hostas and amongst the hardy Geraniums. Fringe Cups make a good addition to the garden and its foliage and flowers work well in spring when other plants are slow to emerge. This accidental combination of Meconopsis cambrica, Tellima grandiflora and Claytonia sibirica is charming and bright at the same time. Tellima grandiflora is an easy adaptable plant to have in your garden. It like rich, humusy soil which retains moisture well during the dry months of summer. It like dappled positions and will bloom admirably in more shady situations. In overly sunny sites it often has more yellowed foliage and is smaller in its overall stature. This last winter was colder than usual and Fringe Cups came through in great form, no damage is done to the foliage and steady growth is seen in the earliest spring. These plants are typically 60 cm. (2 ft.) high and 45 cm. (18 in.) wide but may be slightly large or smaller depending on conditions. They are rated as tolerating -20c. (-4 f.) which is suspect is with much snow cover. Here the extreme cold might get to be – 15 c. (5 f.) with the wild chill added and they do not suffer. Tellima grandiflora is incorporated into several gardens at Government House in Victoria. Here it is the Cutting Flower Garden. Fringe Cups can be used in a variety of ways in the garden. I have seen them used as accents, mass planted, in woodland and more formal settings. They fit into fragrant gardens and ones for cut flowers as well as shade and winter gardens. They also make an excellent mass planting and blend in well with many damp tolerant plants. their delicate flowers on tall stems have an amusing effect against very bold foliage. These plants are much better known in Europe than they are here and we should start changing that. …………..See you on the trails leading here soon……….. Many plants become famous for things other than their flowers. The form and structure of a plant influences how it is used in a garden. The overall color and texture of a plant contributes much to a plants use. Some plants remind people of other things and their name reflects that. Euphorbia species cover all these bases and more. Euphorbia myrsintes(Myrtle Spurge) has wonderful color, texture and form as well as an element which can be somewhat sinister. 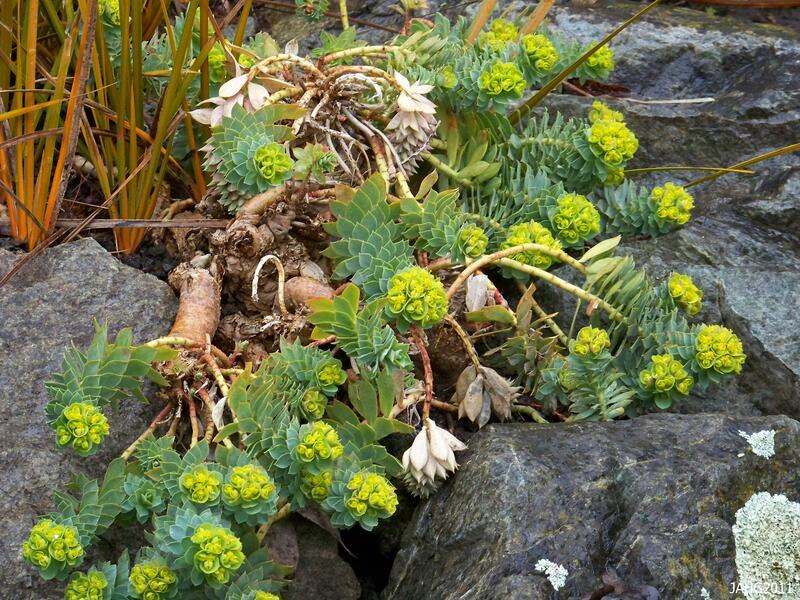 Myrtle Spurge(Euphorbia myrsinites) sprawls across a rock earlier this year. Myrtle Spurge has been known from the earliest time. Theophratus (372-287 B.C.) said it looked like a kind of ‘Tithymallos’ and called it ‘Myrtle-like’. Dioscorides described it as ‘hath leaves like to Myrsine, but greater and strong and sharp and prickly on top’. We also come to Pliny who said ‘Mytites had medicinal uses. Flower heads where harvested and dried long before they had started to swell to blossom and were used with other plants and said to heal sores in the mouth and used as an emetic. We of course do not use this plant for any type of medical or edible use today. 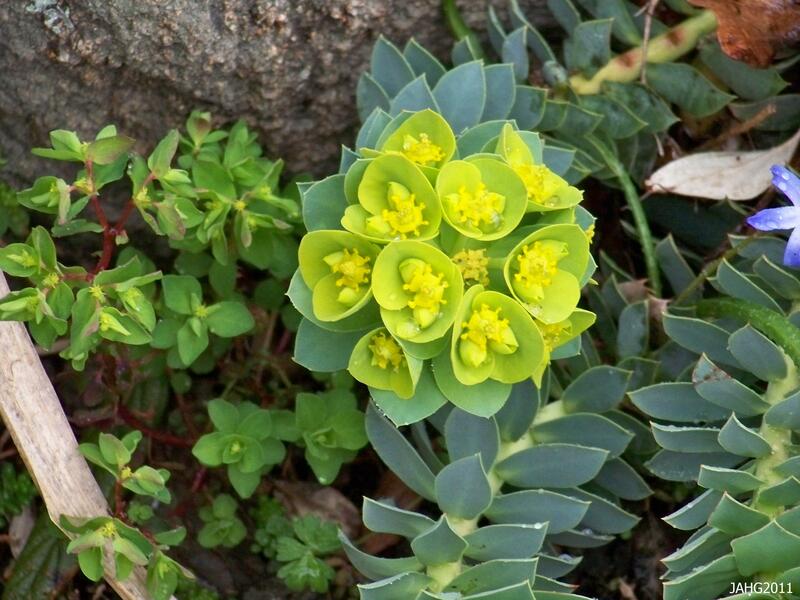 The chartreuse flowers of Euphorbia myrsinites contrast with the distinctive sea green foliage to produce a unique sight in the garden. With such an ‘old’ plant we are not the least surprised to find out where Euphorbia myrsinites comes from; the Mediterranean. Euphorbia myrsinites grows naturally in a wide area from the Balearic Islands near Corsica, moves across southern Italy through Croatia, Bosnia Hercegovina and Montenegro and through Greece. From Greece it is found in Turkey and Asia Minor south and east all the way to Iran. It is found in rocky and sandy areas as well as in open areas under open forests often populated by Pine. The plant grows from near sea level into mountain slopes. The serpentine foliage of Euphorbia myrsinites becomes grayer in the drought and heat of summer here. All Euphorbia species have milky sap wich is released when the plant is damaged. The sap is a form of natural latex which is sticky and contains Diterpene esters which are often irritating to people who have sensitivities. Not all people react to this chemical in the same way I for years propagated many species of Euphorbia and had no trouble, I was always careful when doing cuttings and did my work in well ventilated areas and washed my hands throughly. If you have any concerns do not grow Euphorbias which include Poinsettia of Christmas, or grow them in area where they are out of the way. 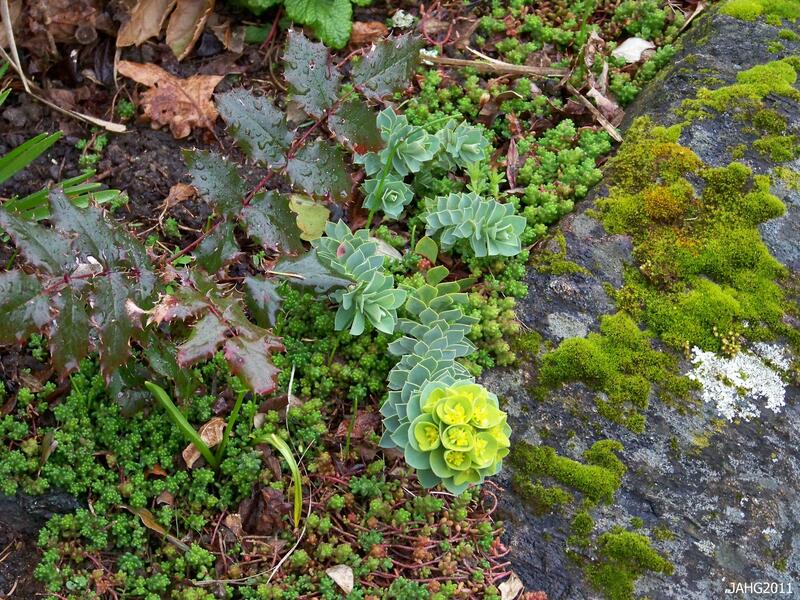 A seedling Myrtle Spurge is seen growing in a crevice with native Sedum and Oregon Grape. Euphorbia myrsinites grows in Victoria well as long as it has good drainage. The best plantings I have seen here are at Government House in the Terrace Garden which is a steep cliff area with gardens running down its face. In this garden there are many tender and exotic plants as well as those which are drought tolerant and can live in areas with little soil. Several species of Euphorbia are featured there. There is also a rough stone staircase which has plants in the cracks including todays plant. Another interesting planting is found at Glendale Gardens where these plants are displayed in the drought tolerant garden. 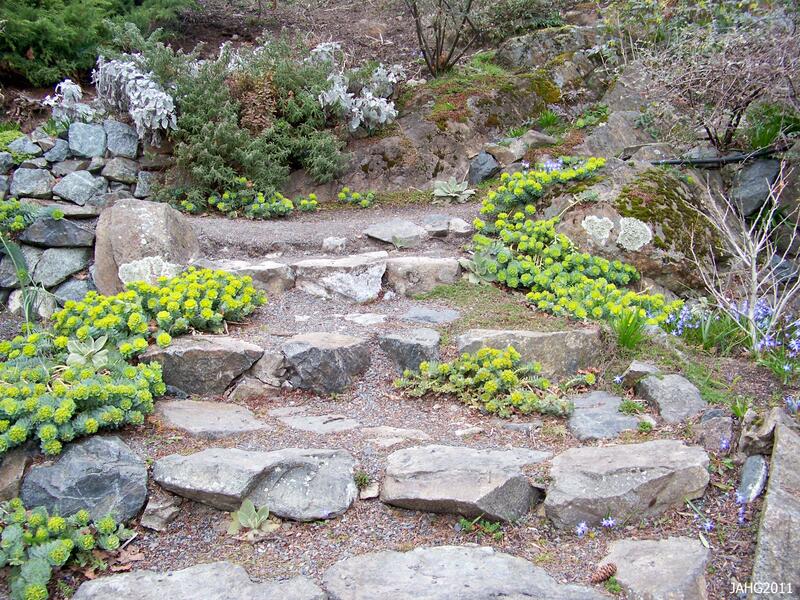 The rock staircase in the Terrace Gardens at Government House is a perfect place to display Euphorbia myrsinites. 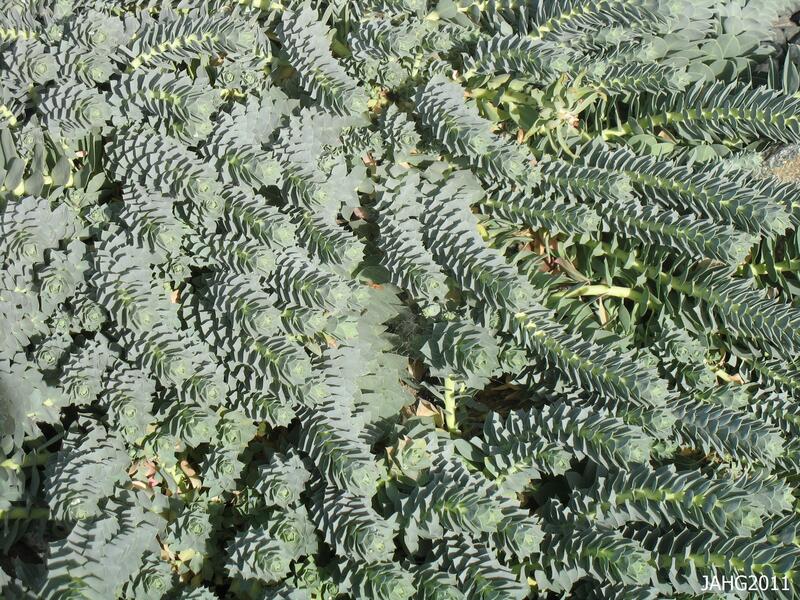 Euphorbia myrsinites is easily grown in soil which is extremely well-drained and not to nutrient rich. Full sun at all times in an absolute must. These plants ideally like to sprawl on rocks or gravel or hand slightly over edges which they dry quickly from rains. This plant has thick leaves and a thick base which is almost a caudex which helps it withstand drought conditions for several months at a time. These plants are excellent in large rockeries, containers, slopes and out of the way crevices which are hard to maintain. Creeping Spurge grows about 15-20 cm. (6-8 in.) tall and sprawls 45-60 cm. (18- 24 in.). It is rated as growing in zones 5 though 9 or tolerates temperatures down to -29 c (-20 f.) with perfect drainage and protection from winter winds. Here the thick caudex-like rootstock is visible where this Myrtle Spurge has been pulled out slightly. Myrtle Spurge often is not long-lived but can produce seedlings which can be moved into place. Seedlings also are easily removed if not wanted or remove the flower heads before the seed has ripened. In some areas Euphorbia myrsinites has been classified as a noxious weed for it has been able to seed and spread into unwanted areas. It can not be grown or brought into Colorado, Oregon or Washington states. It is up to us as nursery growers and gardeners to make sure we are not causing a problem by not taking care of our plants. by removing spent flowers or disposing of seed heads we can make sure that attractive but foreign plants do not become a problem in the future. An Odd Couple For The Iris Family. Another grey week and another plant hunt for something special. Usually I have a list of plants in mind but right now it is hard because some of the plants I wanted to do were damaged by an unusually hard freeze which came in early November last year. At that time many of the plants were not hardened off for the winter with the damage especially seen by broad-leaved evergreens which have much browned and dead foliage now. In my wandering last week I stumbled upon two plants of the same family which are stars at this time of the year. They are the Algerian Iris (Iris unguicularis) and the Stinking or Gladwyn Iris (Iris foetidissima). They are the stars for different reasons as you will see! Winter or Algerian Iris (Iris unguicularis) is sometimes incorrectly labeled by its old name of Iris stylosa. The first stop we make is with the Algerian or Winter Iris with its lovely large violet blooms. It was first described by Botanist/clergyman Jean Louis Marie Pioret (1755-1834) in his journal ‘Voyage et Barbarie’ in 1789. He had been sent to Algeria by Louis XVI between 1785-6 to study the flora. The lovely Iris is more widespread and found in area from Algeria and Tunisia across north Africa into Turkey, Greece Crete and Malta. In the vast area it is known to live int there is some variation in color and form. The type of Iris unguicularis I have found in Victoria seems to be the 'Algerian' form which has the largest flowers of the species. Algerian Iris produce new leaves in late spring and through the summer. Often you can clip the old leave edges back when they get looking tattered. Iris unguicularis likes the sunniest, driest spot in the garden with the grittiest soil. At Government House in Victoria the plants are perfectly place in the terrace garden which is on a southern exposed rock-face. The warmer and drier the summer the more blossoms will be produced. One thing about these plants is they hate to be moved or have their roots disturbed in any way. A just opened Algerian Iris in the late afternoon sun has delicate coloring and scent. The Gladwyn Iris is from more northern areas from southern England, Ireland through Portugal, Spain Canary Island on to Italy and finally the island of Malta. The Gladwyn Iris (Iris foetidissma) is more famous for its brightly colored seeds which are seen during the winter months here. The ‘Stinking Iris has gained an unfair reputation from its name. One has to crush the leaves and the flower to obtain even a faintly unpleasant scent. 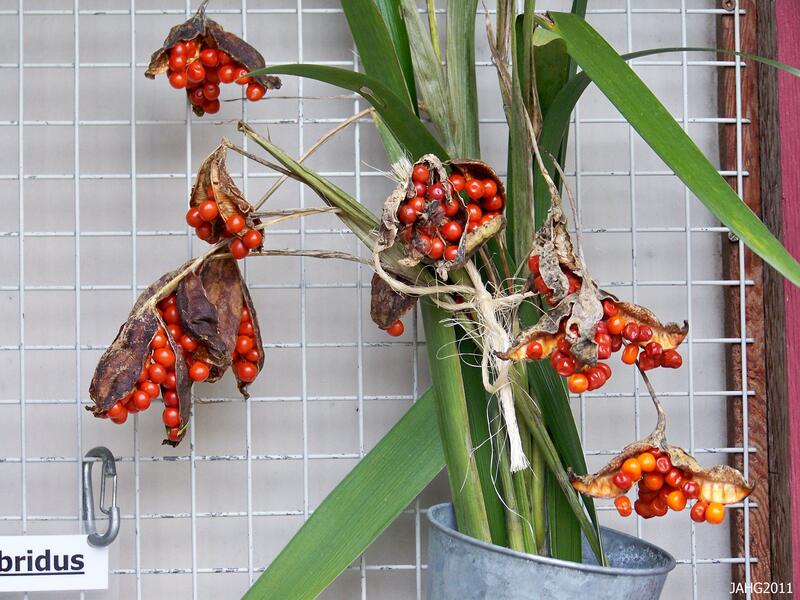 Iris foetidissima is a plant which has long been with us. 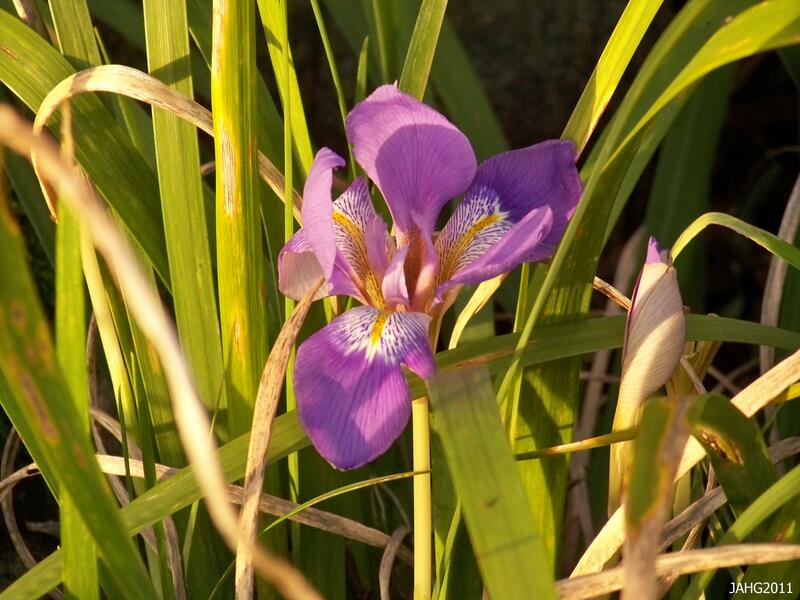 It blooms in the traditional Iris time of late May and June, but, the flowers are small and often hidden in the foliage. The colors range from a creamy ochre into plummy shades. 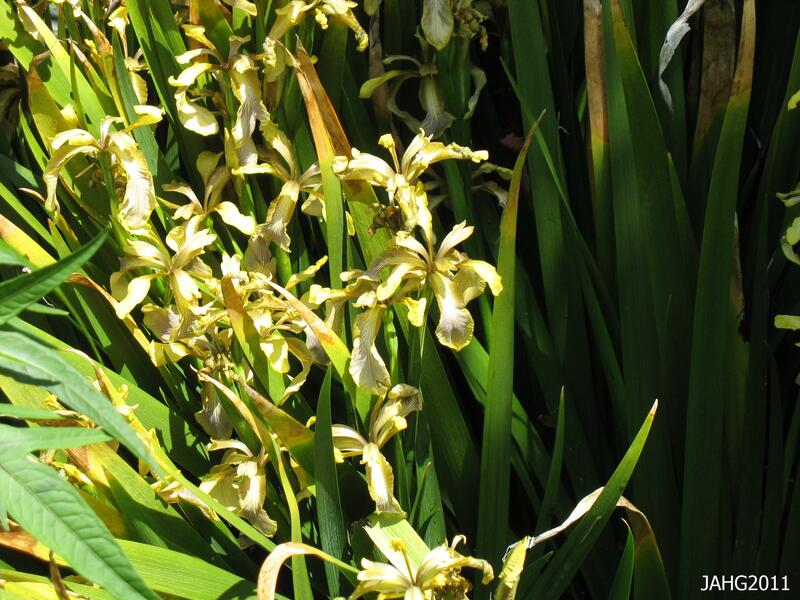 The flowers of Iris foetidissima are often hidden in the plants foliage. The Gladwyn Iris is a plant of the woodlands, hedgerows, scrubs and cliff edges and other rocky sites. It is a plant which likes chalky and limestone heavy locations. 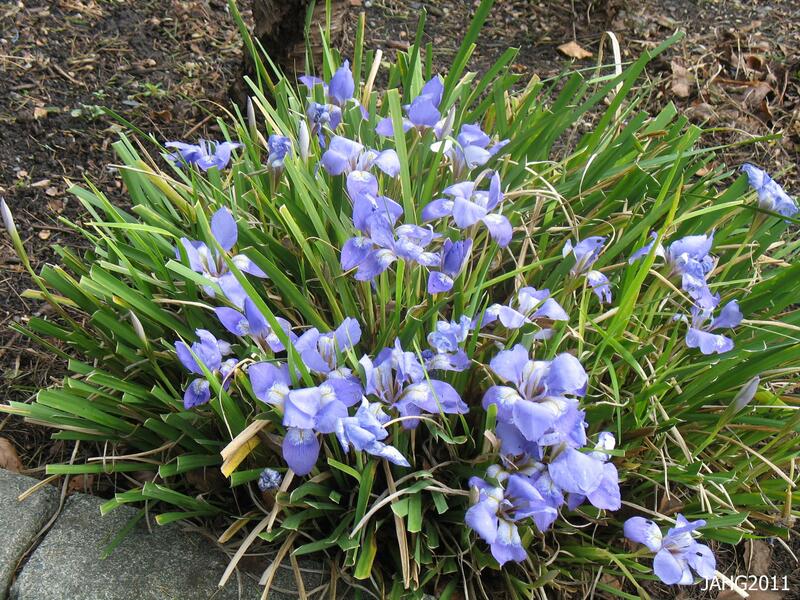 Gladwyn Iris can grow in the sun or dappled shade and like average soil. They like sufficient water when they are growing in the spring and then dry conditions the rest of the year.After blooming it produces larger than average seed pods which ripen through the summer and into early winter when they burst. Inside the pods are usually bright orange seeds which remain colorful throughout the winter. The other day I noticed pods recently opened and others still green and waiting to split. Just like the flowers there are other known seed colors which are sought after and they range from golden yellows to creams and white. Probably the most want of the Gladwyn Iris is Iris foetidissima ‘Variegata’ with beautifully uniform cream stripes running up the leaves. The Variegated Gladwyn Iris (Iris foetidissma 'Variegata') is most sought after, as you see they are stunning in dappled location at Glendale Garden. Algerian and Gladwyn Iris are about the same height 45-60cm. (12-18 in.) and width They also share the same temperature tolerance to 15 c. (5 f.) or zones 7 through 9. Both plants are drought tolerant when they have been established. They are rabbit and deer resistant but can be damaged by slugs and snails. They make excellent specimens, accents s, mass evergreen plantings and work well in containers. Both of these species are not easy to find in plant centres or garden shops, the best bet would be to find them at garden sales or from specialty Iris growers. 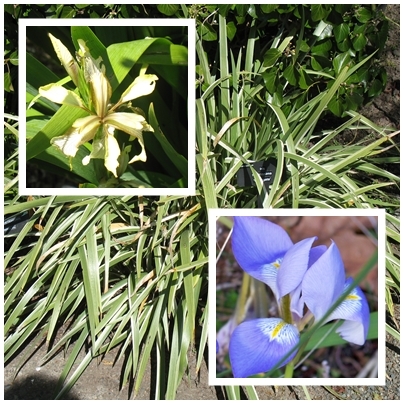 Gladwyn Iris on the upper left and Algerian Iris on the lower right. ……See you soon when we travel the path of plants again….. Although it has been unusually cool and wet already this winter it is surprising how much is going on in the garden right now. Already the buds on many shrubs are stirring and growing larger and I have seen germinated seedlings with their first leaves emerging from places. The earliest blooming plants are starting to show up. One group of plants which never let us down are Hellebores and several species and hybrids are blooming or are in bud. One of the more interesting and fairly new to this area are the Helleborus x ericsmithii group. 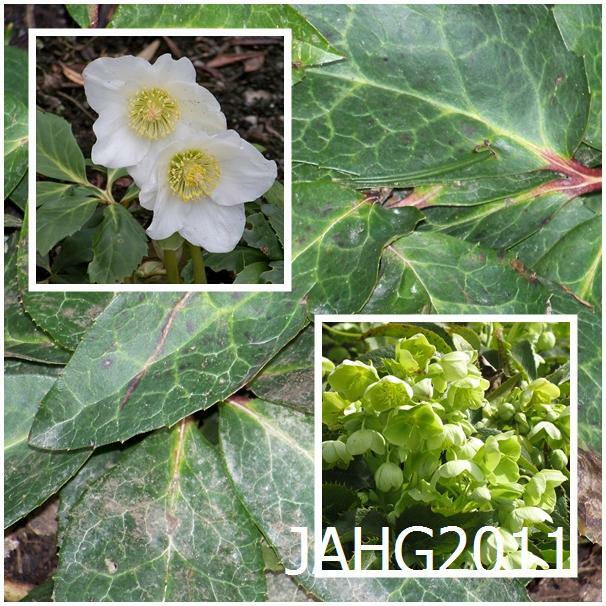 This plant selection was formerly known as Helleborus x nigerstern. Helleborus x ericsmithii brings together the best genes of 3 species into a spectacular plant. Helleborus x ericsmithii is named after the important plantsman and propagator Eric Smith (1917-1986) who was the first person to successfully cross Helleborus niger( the Christmas Rose) with Helleborus x sternii ((H.argutifolius x lividus). 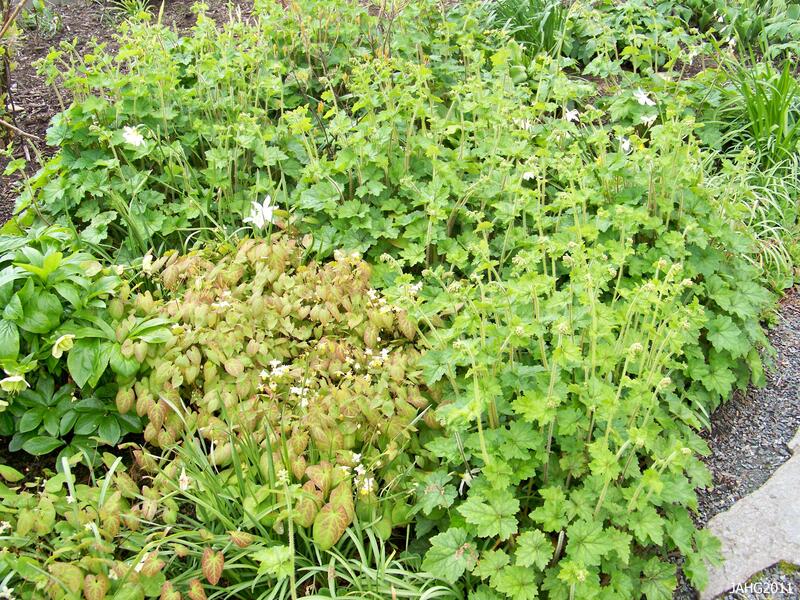 Here we have Helleborus niger on the left, H. argutifolius on the lower right with H.lividus leaves in the background. Eric Smith grew up in South Hampshire England, he came from a middle class family. In 1940 he joined the army and was stationed for part of his time in Italy. After the war he was educated as an architect and worked as an assistant for several year. He always had a love for plant and joined the famous nursery Hilliers in Winchester from 1961 to 1965. While at Hilliers he worked as a propagator and first made the cross which lead to the group of plants we know as Helleborus x ericsmithii today. Later in the 1960s he would leave Hilliers and continue developing many other plants which are now associated with him. 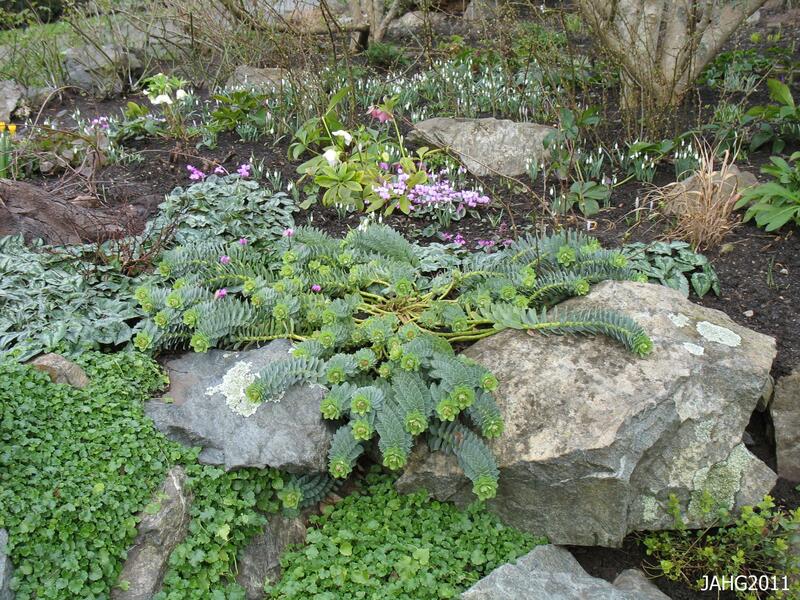 These plants would include many Hostas, Bergenias, Anemones and Kniphofias. 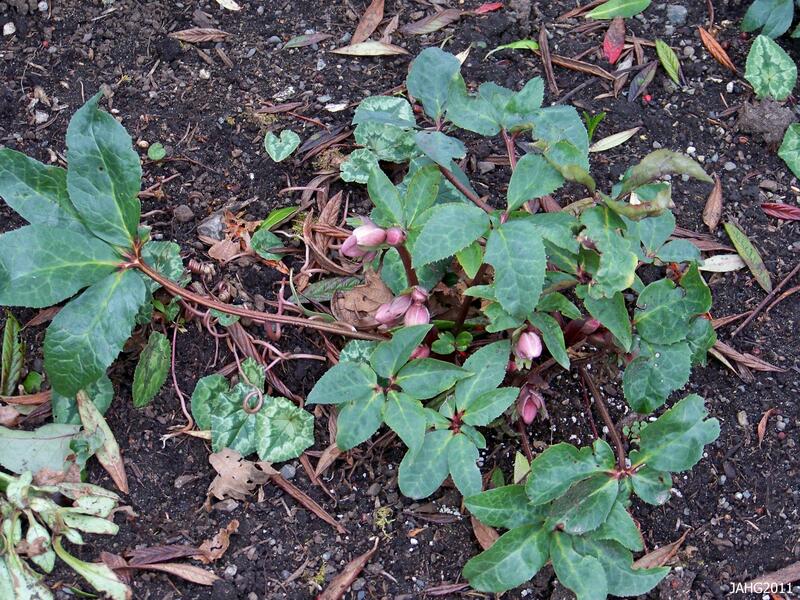 A fine combination of plants found at Government House with Helleborus x ericsmithii being the star in earliest spring. Each of the 3 species of Hellebore brought something important to the new Helleborus x ericsmithii. Helleborus niger brought the largest flowers. Helleborus argutifolius brought much-needed tolerance for the cold, green shades to the flower color range and toughness to the leaves. Helleborus lividus brought pink tones to the flower coloring and improvement in the leaves with wonderful silver veins which new varieties are showing off more than the past. 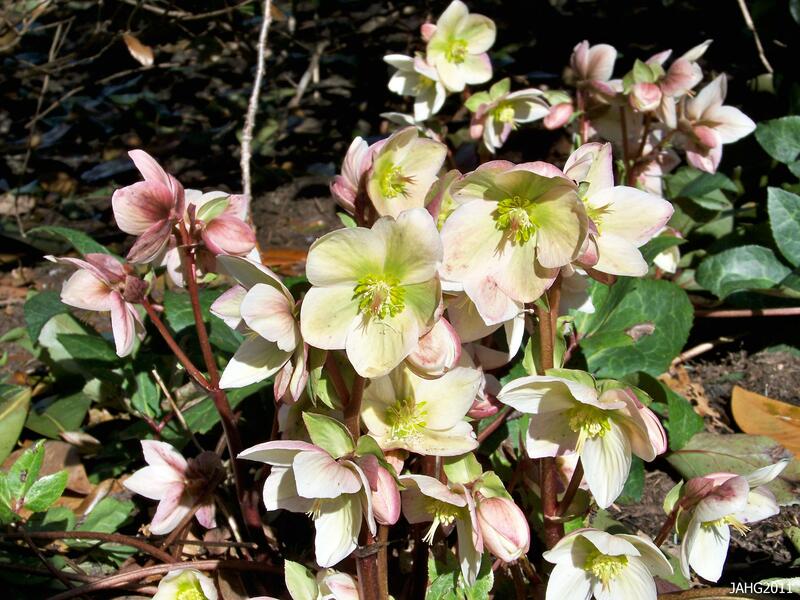 The pink and green shades blend together with the cream into a tapestry of tones in Helleborus x ericsmithii. Helleborus x ericsmithii brings us a long blooming season which usually begins here in early January and lasts through March. As the flowers are somewhat papery they generally can stand up well to the wet weather. The only thing one sees is soil which may splash up on the lower flowers. The leaves may sometimes become damaged when we have a particularly early frost such as the one we had in November of last year. Have no fear new leaves will appear to replace any of the damaged ones. This recently planted Helleborus x ericsmithii and will with time grow to be a formidable plant with countless blossoms. Helleborus x ericsmithii is an easily grown plant and can be used in many ways as long as you fulfill its basic needs. This is a plant which likes rich deep soil that is well-drained, it does not like to have overly wet roots as this can lead to rot. In the area I live in the Pacific north-west this plant does best in about half day sun, dappled situations are the best. 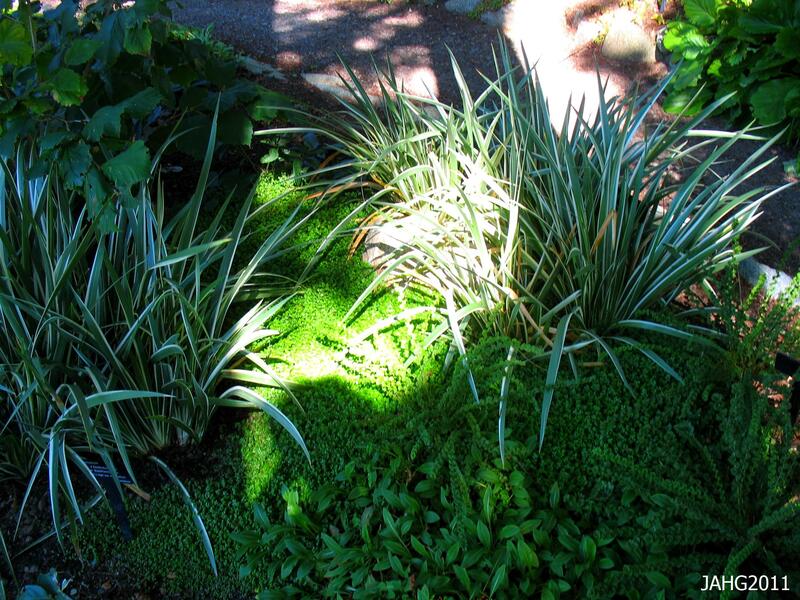 In hotter and drier climates it will need more shade and more frequent watering. 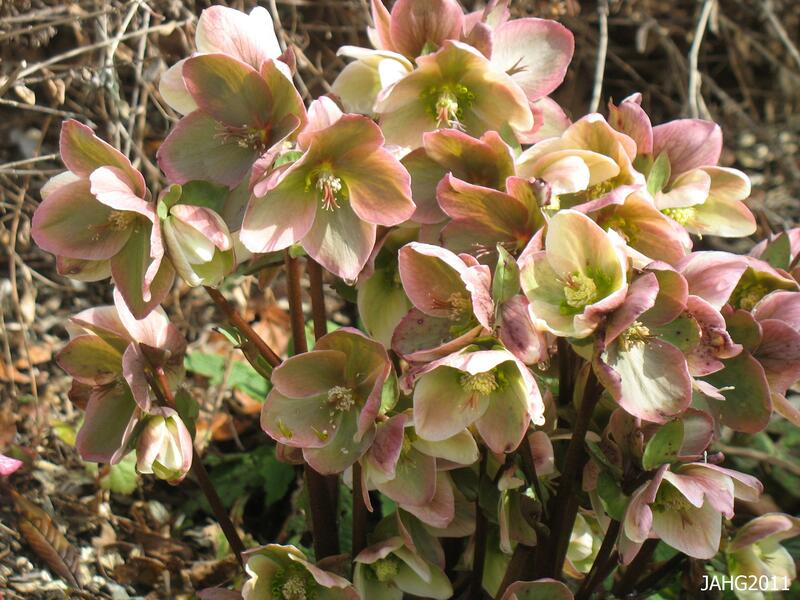 Another thing to keep in mind is all Hellebores hate having their roots disturbed and sulk or sometimes die, therefore, carefully choose where you are going to place them and try not to move it. Always remove spent leaves and flowers to keep the area clean. 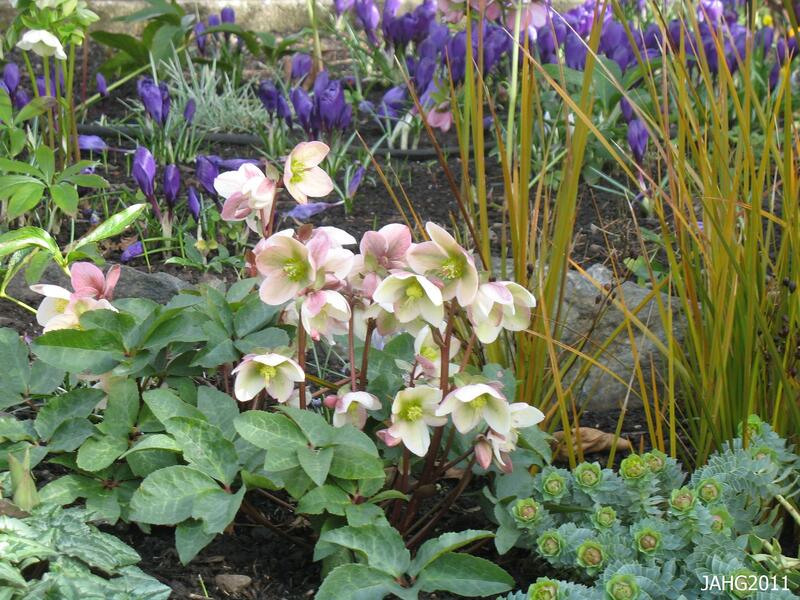 Several Helleborus x ericsmithii plants make an excellent container planting for winter color. Helleborus x ericsmithii are used in many ways, in containers, as winter color and in the winter garden, as a specimen or accent or a border. These plants grow 20-25cm. (8-10 in.) 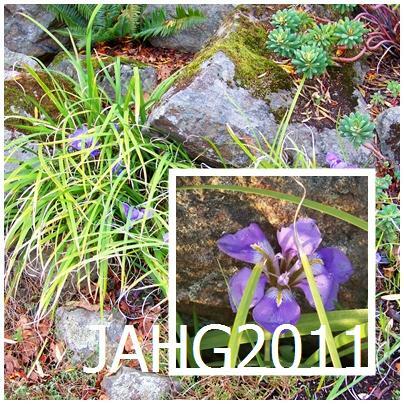 height and grow into a clump up to 30-40cm (12-15in) wide making it an excellent addition to the rock or alpine garden. These plants are hardy to about -15 c.(5 f.) or a little colder with protection.These plants have few pests other than Aphids which may appear when the flowers are young and tender. 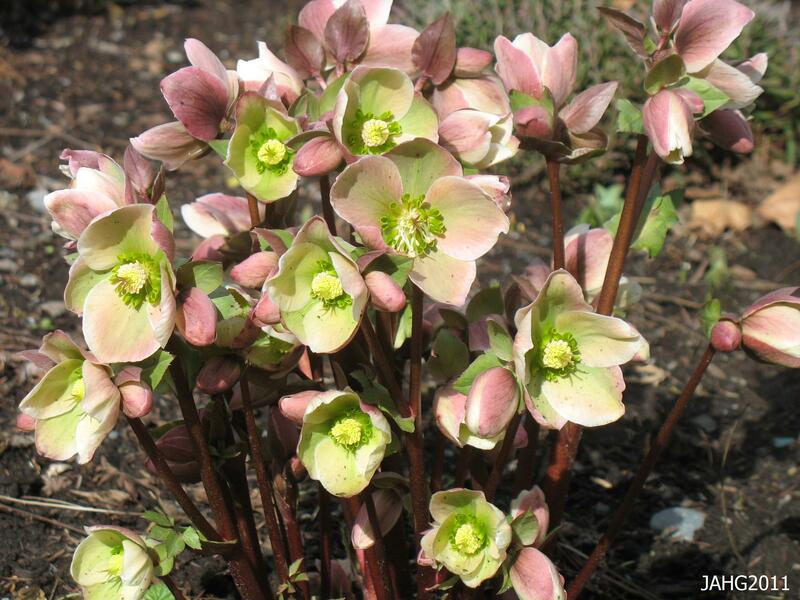 These Hellebores are said to be deer and rabbit resistant. These aged flowers of Helleborus x ericsmithii will soon be finished as they are sterile and do not set viable seed. Propagation of Helleborus x ericsmithii is done by tissue culture or you can carefully divide your plant after is has finished blooming. Be careful when dividing the plants and do not damage the roots. Look at your nearby nursery or garden centre for many newer varieties which have a broader range of flower colors and variegation in the leaves. Many of the new plants are spectacular and can be hard to track down. ……Until we meet again in the sun or showers…..
Semi-Cactus, Collarette and Decorative Dahlias. The muted colors of the autumn season will soon be upon us, the plants are beginning to look tired from the long hot summer. The end of the season brings on a slow decline. It is harvest time, the moon is big and the crops are high and full of ripeness. Certain plants remind me of this season because I would only see them now when I was growing up in the north. Dahlias are the flowers I remember being huge and have brilliant and interesting petals and color combinations. A sumptuously colored Dahlia with a 'Ball' classification of flower. 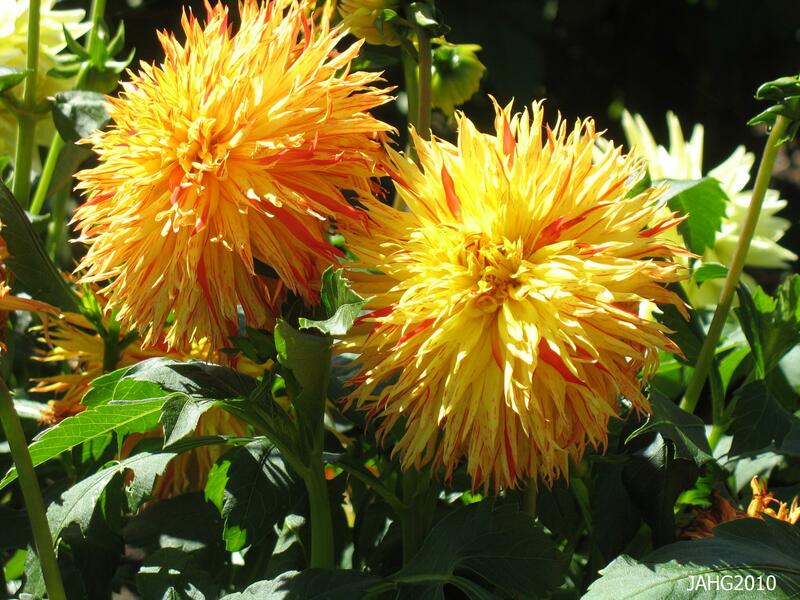 There are about 35 species of Dahlias which all originated from central America, from Mexico through Guatemala, Hondurans Nicaragua, Costa Rica and other areas. The first Dahlias which was documented were encountered by Francisco Hernández de Toledo(1514-87, who was a naturalist and physician to the King of Spain. He was sent on the first scientific exploration of the new world in 1571 and spent 7 years gathering and classifying specimens he collected and interviewing the local people on their use. His works were published in 1615. The first species Dahlia recorded would have been single flowered and look something like this. Later another botanist, French Nicolas-Joseph Thiéry de Menonville was sent to Mexico in 1776 to steal cochineal insects (the source of red dye at the time). He went unofficially succeeded in bring back the insects. In the notes of his adventure he notes Dahlias were unusually attractive flowers. Dahlias where first grown in Europe at the Madrid in the botanical gardens there in 1789. The seed had been sent from the botanical gardens of Mexico. 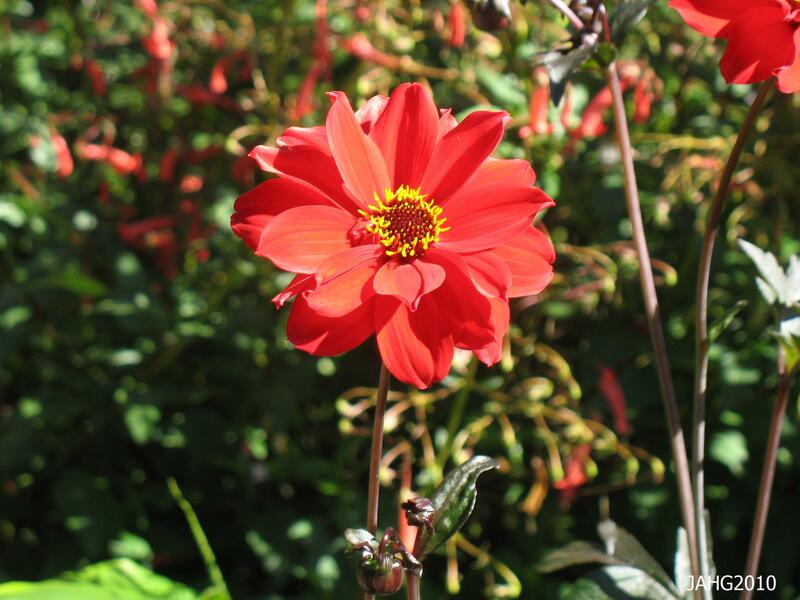 The first plants were named Dahlia coccinea in 1791. Dahlia 'Bishop of Llandaff'(1924) is one of the most famous culitvars of the past and is now widely available. Other seeds of different species where later germinated in England and roots were sent to Netherlands to grow. Crossbreeding began from these original collections of plants is where all our fancy Dahlias come from today. During the 19th century thousands of new cultivars where grown and the best were selected for their brilliant colors and unusual flower and petal forms. 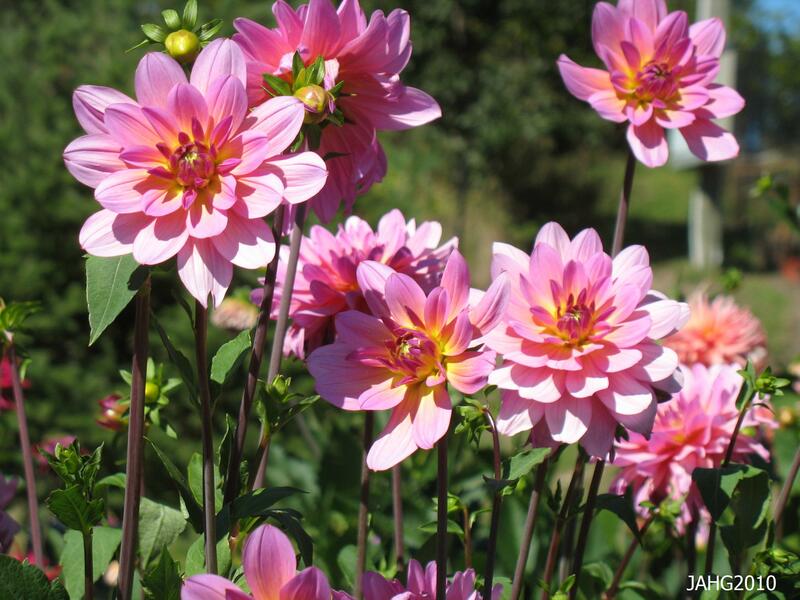 The name Dahlia honors Anders Dahl who was a Swedish botanist. 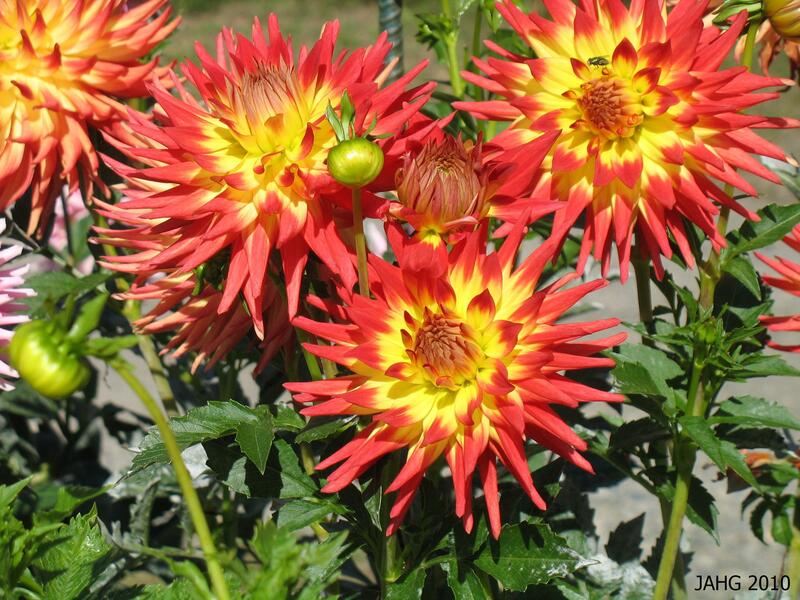 This brilliant bi-color Dahlia is classified as a ' Semi-Cactus' flower form. Since 1900 flower forms have been classified into groups. Dahlias are now bred for competition which is very popular here, at this time there are test gardens and competitions which are judged. Kids love the flowers which can range in size from the small cm(2in) to 30cm(1ft) or more in diameter. The overall size of the plant also have an extraordinary range from less than 60cm(2ft) to 3.5m(10ft). The range of color and petal forms and heights is due to the fact that they are homologous and have 8 sets of chromosomes compared to the normal 2 which most other plant have. This Dahlia cultivar exhibits not only very unual petals, but, also streaks of colors in them. 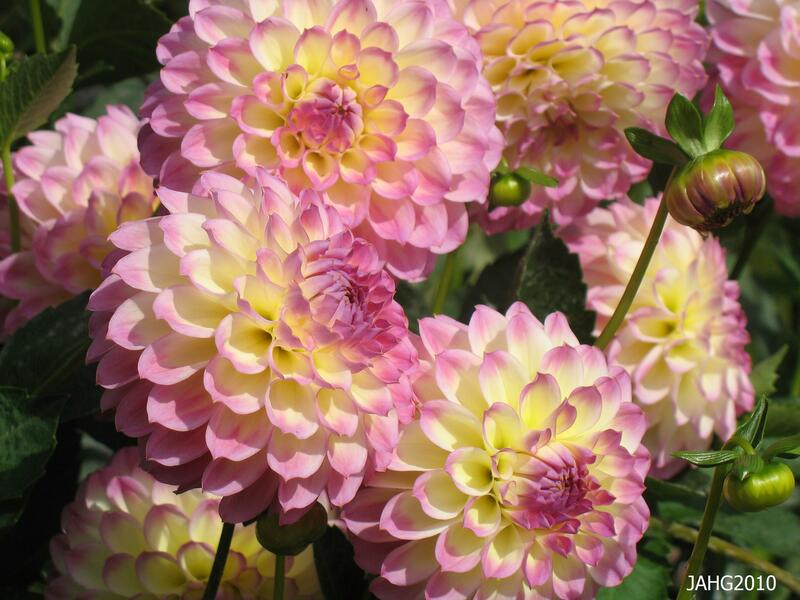 The popularity of Dahlias is partly do to the ease of growing them and their availability in such a range of colors and forms. You can buy them anywhere that plants are sold as roots, seeds or in packs of small plants. Like all good plants they like rich, deep, well-drained soil with plenty of nutrients. They need full sun and plenty of water during their growing and blooming stages, this will help them avoid getting unsightly mildew(greyish powdery fungus on their leaves). The larger flowered types should be in a shelter from strong winds. 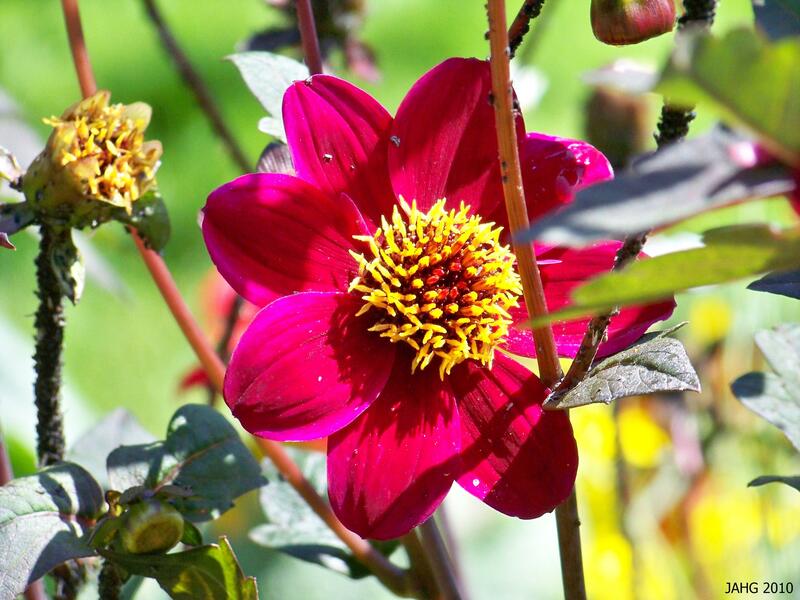 The vivid colors of Dahlia flowers are hard to overlook in the garden at this time of the year. Although Dahlias are considered hardy annuals and can take a touch of frost and survive If you want to save the tubers it is best to harvest them before this happens. Dig them up carefully as the skin is thin and can be damaged easily.Remove the leafy tops and let them dry slightly, After they have dried a bit place them in a layer of dry peat moss. Place them in a cool dark place for over winter storage. Check them periodically for any signs of rot or decay and cut it off or throw it out. You can have flowers for many years this way. In a few months you will notice small bud which show which to plant them. Plant them when all chances of frost is over or start them in a sunny location in your house a few weeks before you plan to plant them. There are many classes of Dahlia flower forms, this is a beautiful Semi-Double form. Dahlias are important to Mexico. The Aztecs grew and harvest the plants for food, medicinal and decorative purposes. The strong woody flower stems were also used for water tubes and pipes. 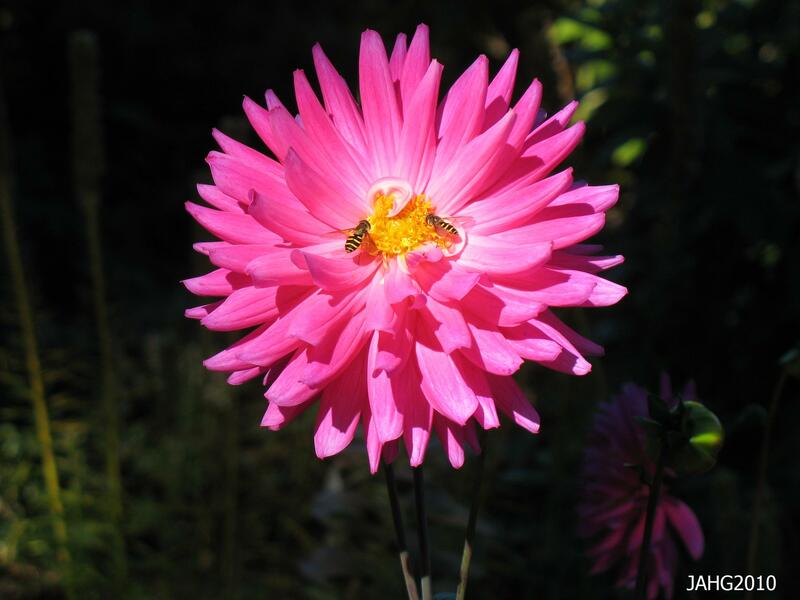 In 1963 the Dahlia was declared the national flower of Mexico. A Fashion Plate in Charteuse and Sea Green. The Baron and the Little Flower. Silver, Gold and Moonshine All in One Plant. I Like My Iris Grape Scented and Variegated Please. A Hosta Imposter and Other Relatives. Click here for copyright permissions!